1 Now before the festival of the Passover, Jesus knew that his hour had come to depart from this world and go to the Father. Having loved his own who were in the world, he loved them to the end. 2 The devil had already put it into the heart of Judas son of Simon Iscariot to betray him. And during supper 3 Jesus, knowing that the Father had given all things into his hands, and that he had come from God and was going to God, 4 got up from the table, took off his outer robe, and tied a towel around himself. 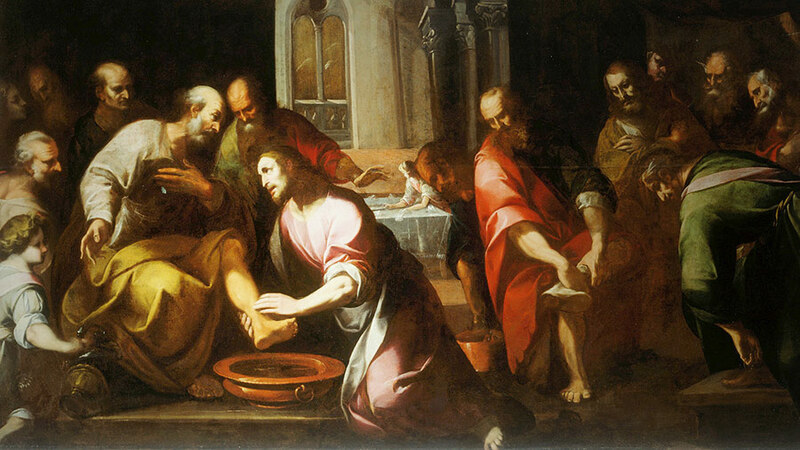 5 Then he poured water into a basin and began to wash the disciples’ feet and to wipe them with the towel that was tied around him. Actually, we care less what outsiders think than what we think and mutually agree upon here inside our esteemed and sacred circle. We order our affairs. We honor reputations, credentials, achievements, proximity to founders, and other sorts of insider status. Each of us has a measure of gravity in the circle. Some have more than others, and it behooves all of us to remember who has the most. It’s especially important for those with less gravity to honor those with more. Those of us who have the most must constantly be on guard, lest our gravity be inadequately recognized in the affairs of this circle. It frightens and grieves us when our gravity goes unaccounted for, and all our striving, sacrifice, and good behavior goes for naught. The next thing you know, they’ll want us to do the dishes or stick around to clean the toilets. In Gravity We Trust. Even slaves have a pecking order, right? We’d rather die than do certain jobs in the world. And if those who witnessed us stooping thought those jobs suited us, (and we knew they thought that about us), we would be dead. Or good as dead. Our gravity would be gone. And no one would ever know we’d once had some. We have but one consolation. At least we weren’t Judas, that bleeping “son of perdition.” That gives us a last ounce of gravity, right? Alas, even of that we can’t be totally certain. We are goners. Vanished. Forgotten. Not even dust on God’s scales. Our Leader and Teacher, Spectatissimum Dominum, will die tomorrow in what looks to us like tragedy and gross injustice, but he keeps calling it his “hour,” the moment of his “glory,” or in his own language, the moment that will reveal his weight, his gravity. And now he says it starts tonight, here, in this room, at his peculiar Henkersmahlzeit—the meal at which a condemned prisoner gets to choose the menu, the games, and the music. And what does Jesus choose for this night of all nights? All he wants is to hold our flesh and blood in his hands, and one by one, wash us, beginning with our feet, that part of us none but we ourselves, or our mothers, or the undertaker who will bury us, ever touches or washes. In that curiously embarrassing, intimate moment, he becomes one flesh with us, for from now on, having died our death, our feet will be his feet, and using them, nail-marks and all, he will roam the earth, loving the lovable and unlovable, forgiving the forgivable and unforgivable alike. His gravity and glory will show up everywhere we go. We wanted his place at the table, or thought we did, because we wanted some reward for our effort, payoff for our pain. Now we find that he wanted nothing more than to take our place. Thus, we now share his gravity, his glory, which still, like always, shows up in under-the-table sorts of places the world hardly notices. But we notice. By faith, we now see and know his love that transcends old orders, commandments, and measures of gravity, and in believing, we share in and have his gravity. All we could imagine. And then some. This night is dress rehearsal for our Henkersmahlzeit. Every other day and night of our lives is, or could be, the occasion of our hangman’s meal of last requests; for tomorrow we, or you, may die, and all we have is this moment to hold each other, share in our Lord’s forgiveness, give thanks for all the days and nights we have had together in this company gathered in his name, and eat and drink his simple meal. We share this meal here, in the circle where we were washed and came to trust in our true gravity, but this meal creates a restlessness in our feet, which the teacher took in his hands and washed. These feet will go now into all the world God so loved, carrying along still-wounded hands that would gather every creature into the infinite embrace of the one who, even on his last evening, wanted nothing more than to hold, wash, and have them as his own.